This double CD (1. 44:15 / 2. 41:41) unites absolute rarities of famous German band Aera. 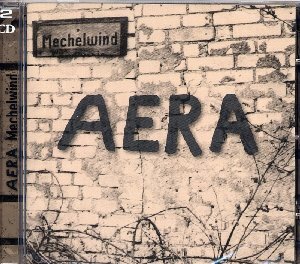 AERA founded in 1972 by "Ihre Kinder" guitarist Muck Groh and 2066 & Then keyboard player Steve Robinson were in their very beginnings, when they recorded their special extended version (26 minutes) "Mechelwind Suite" of their later classic title "Mechelwind" (on album "Hand und Fuss", LHC 44, vinyl-edition). The Mechelwind Suite is divided into 5 parts and is rather different from the later album-version, not only because of Steve Robinson's excellent keyboard playing but also because of Muck Groh's fine guitar playing and Klaus Kreuzeder's pleasant sax tunes. CD 1 finishes with two SWF-recordings "Hodibbel" and "Mechelwind" from Oktober 1973 again with 2066 & Then keyboarder Steve Robinson. CD 2 contains a live performance of AERA from 23.12.1973 with the same line up as on CD 1. Highlights are the 15-minutes-version of "Hodibbel" and 12-minutes-version of "Papa Doing". The recordings show AERA at their very best during their first decade. Both CDs are digital remastered from the original tapes. Double CD comes with comprehensive booklet with a lot of unseen photos and band history told by founder-member Steve Robinson. A must have.